When it comes to beets, there are two kinds of people in the world - those who love them and those who are scarred by memories of bad, overcooked, smelly, school cafeteria beet cooking reinforced as an adult by whatever it is they put in cans. Beets are delicious, people! They're sweet for heaven's sake! I guess you know which type I am. Roasting beets is beyond simple. Wrap them in aluminum foil, stick them in the oven till they're soft, peel them like you would a cooked potato, slice and serve. They're great with an acidic dressing or pickled in a brine and ideal with a sharp creamy cheese such as feta. Wrap the beets tightly in aluminum foil, place on a baking sheet to catch any drips and roast in the oven for 45 minutes to an hour or until the beets can be easily pierced with the tip of a knife. Remove from the oven and allow to cool enough to be handled. Peel the beets (the peel will come off easily with a paring knife) and dice. Make the dressing by whisking together the olive oil, lemon juice, mayonnaise or mustard (to help emulsify the dressing), honey and sumac in a bowl. Season with salt and pepper to taste. 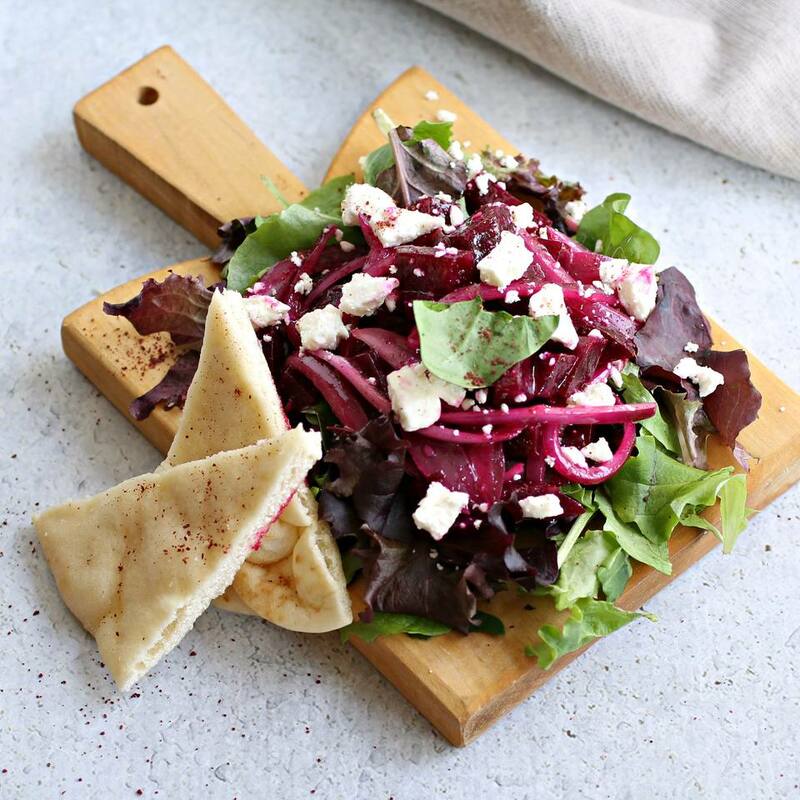 To assemble the salads, divide the salad greens evenly on four plates, top with an equal amount of sliced red onions, diced beets, and crumbled goat cheese. Drizzle with the dressing and serve with slices of pita bread.